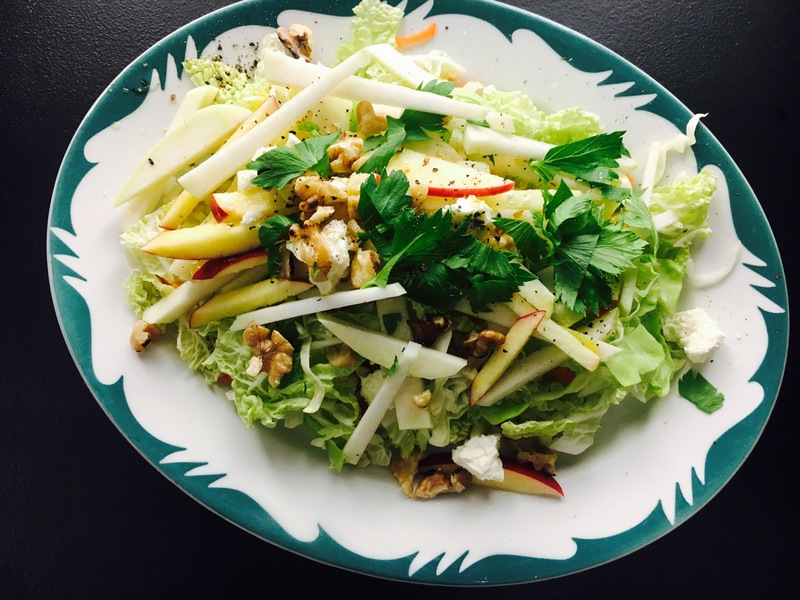 Need a new idea for a crunchy Thanksgiving salad using wintry vegetables? Sure, you could go the kale route, but why not try chopped napa cabbage and thinly sliced or shaved jicama or kohlrabi? Both are fresh and crunchy; kohlrabi is a brassica vegetable and once peeled, tastes like the inside of a broccoli stalk. Jicama is a root vegetable that doesn’t look like much, but is so snappy and fresh tasting you’ll find all kinds of uses for it, from veggie platters to salads. Measurements here are up to you – use as much of each ingredient as you like, depending on your taste and how many you have to serve. If you like, top with chopped fresh Italian flat-leaf parsley, too. 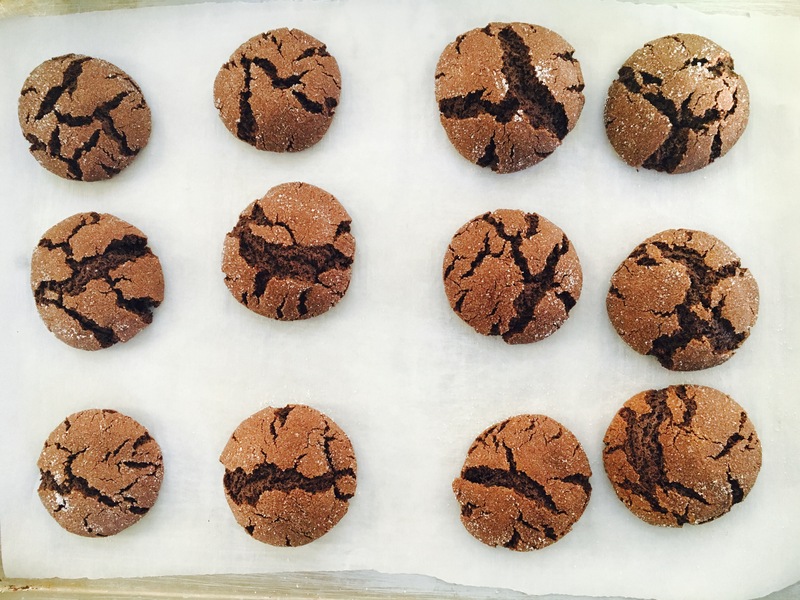 ‘Tis the season for holiday cookies, and this year these chewy Chocolate-ginger Molasses Crinkles have become one of our go-to recipes for Christmas cookie exchanges. They’re easy to make, fun for kids to roll in sugar, and combine warm cinnamon and ginger with deep chocolate flavour. The recipe makes over 2 dozen, so there’s enough to package up and give away, plus a few to nibble on! Cookies are also perfect for teachers, coaches and other people kids want to thank at this time of year. Make sure you don’t overbake these; they need to stay chewy. They should be set around the edges, but still soft in the middle – they’ll firm up as they cool. As the weather turns chilly, cold season is creeping up -it seems everyone is coming down with something, or has a cough or a case of the sniffles. Chicken soup is a generations-old remedy used around the world to fight colds and flus and generally make those who are under the weather feel better – and taken care of. Making a pot of soup from scratch is not difficult – a good thing if you’re the one who’s coming down with something. When we do roast chicken for dinner (even one from the deli), we like to leave some meat on the bones for a meaty stock that’s easily turned into a hearty soup; and around the holidays, there’s almost always chopped roasted turkey in the freezer to add to soups like this one. This is a slightly heartier version of a classic chicken noodle soup; using barley instead of noodles boosts fibre and other nutrients, but you could swap regular egg noodles too. They’ll take less time to cook – about ten minutes. The addition of greens makes it even more nutrient-dense and rich in vitamin C – a good thing when you’re trying to beat the sniffles. In a large saucepan or small Dutch oven, heat a drizzle of oil over medium-high heat. Saute the onion, carrot and celery for a few minutes, until soft; add the chicken and cook for a few minutes, until it turns opaque. Add the stock, barley, thyme and 1 cup of water and bring to a simmer; cook for 30 minutes, or until the barley is tender. Remove the sprig of thyme, season with salt and pepper as needed, and add a handful of baby spinach or torn kale to the pot and stir until it wilts. Serve immediately.